Looking for something fun to do this weekend? 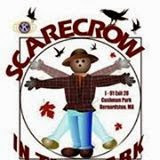 Come to the Scarecrow in the Park (Cushman Park) in Bernardston, Mass. 2 days of great fun celebrating Halloween. The fun starts Saturday October 25th at 10:00 a.m. with a road race beginning at Pratt Field and the artists and crafts booths will open. The long list of activities throughout the day include huge tag sale, musical events, tractor parade, halloween party, hayrides, outdoor movies and more! Sunday is filled a great day of music.